“It is a privilege for our brigade to get these new platforms, developed by engineers in Israel,” Maj. Liad Cohen, Technology and Maintenance Officer in the Nahal infantry brigade’s 50th Battalion, told JNS. The Nahal brigade is the first to receive the Eitan. “This is the forefront of technology. These abilities give us superiority and real operational advantages,” he added. “It provides independence, lethality, mobility, and survivability. This is a very rapid armored vehicle,” Cohen added. The Eitan can maneuver to distant destinations, and get soldiers there rapidly, he stated. It can travel on and off road, through difficult terrains, and does not require slow-moving military trailers when moving on roads. “Today, we have an early vehicle to conduct experiments,” Cohen said. In April, drivers from the 50th Battalion underwent intensive training with the APC. They spent a week in operational driving conditions, and brought the Eitan to a battalion-wide training exercise. “We saw its abilities,” said Cohen. Each Eitan vehicle carries 12 soldiers, moving them “to any arena that the state needs to reach to protect itself, and moving them quickly from their base to the border – to any border,” he added. The Eitan’s ability to engage threats will include a range of weapons that can be attached and replaced on board, such as a powerful 30 mm automatic cannon. 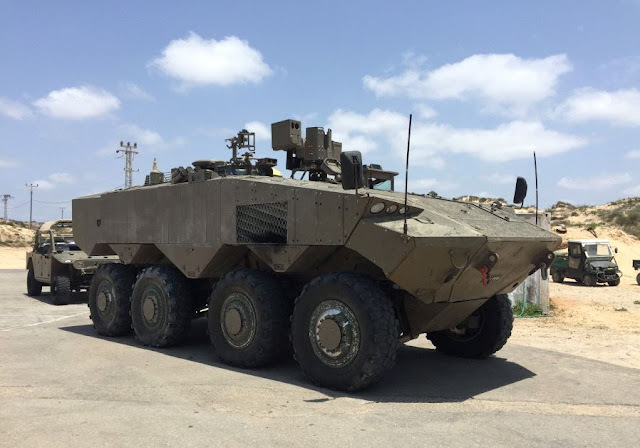 According to Cohen, the arrival of this armored vehicle is part of a bigger process, which is aimed at making the modern IDF battalion as independent as possible, able to conduct its own battlefield affairs. “The amount of times spent in combat zones is growing. We want to be less dependent on the home front, and less dependent on the need to bring logistics from outside the battle zone,” Cohen said. The Eitan will also be able to act as a military ambulance, evacuating the wounded away from the frontlines, due to its speed and size. As time goes by, Cohen said, the Nahal brigade will seek to help deal with the few disadvantages that the APC still has. Would like to hear what the "few disadvantages" that they're talking about.